I do not destroy national monuments lightly; I do so only to illustrate points of grave significance. Nearly a decade ago I deposited four colonies of fecund and profligate Ravenous African Tick Termites into Redwood National Park. Whenever those towering majesties fall to dust, it is clear that life is war, and living the fruits of victory. As in life, the goal in a debate is to survive, to win, not to make a good point or learn from your opponent’s perspective. Pyrrhic victory is apocryphal, second place is first loser, and No Fear! Look about you at those who persist – there is room enough only for victors. Phase 1: Establish a Vocabulary of Victory. In spite of my excellent advice, you may find yourself cornered. Perhaps your opponent is crafty. Or, far more likely, you lack the rudimentary functions required to read and comply with a simple set of instructions and I’ll once again be forced to correct your serially aberrant behavior. Corner one: your opponent is obviously right and has demonstrated that you are obviously wrong. Solution: reduce the scope of your argument to a trivial and subjective claim by making use of excessive conditionals. Solution: deride his source of information as incomplete, a tool fit only for plebeian nobodies. Solution: level the playground. 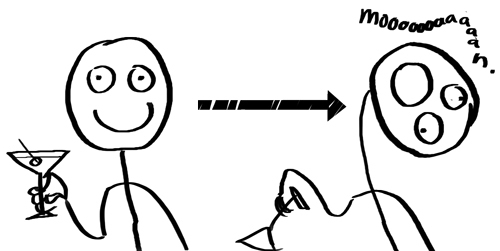 Rotate your head 180 degrees and produce a resonant moan (follow panels in a rightward fashion). Corner four: Your opponent possesses humility. Some people will put their egos aside in the misguided and obdurate pursuit of knowledge. Solution: These people are a statistically inconsequential portion of the population. Nobody cares what they say. There will be no investigation when they “disappear”. There is no “if you win”; you’ve had plenty of time to be a loser prior to the rapture of this article. So when you win, be as unpleasant about victory as possible. The goal is to preempt future arguments. No animal bites a porcupine twice.